There have been some amazing dunks in the history of this contest. Since the inception of the NBA’s Slam Dunk Contest, fans have often been treated to an incredible show. Some of the best athletes and NBA stars have thrown down in the competition with creative, electrifying dunks. With the latest iteration of the event taking place in Charlotte in just under two weeks, it got us thinking to the best ever throwdowns in Slam Dunk Contest history. Here are our choices for the the top 10 best dunks in that contest. In the late 2000s, props were getting more and more popular among dunk contest participants. Orlando Magic center Dwight Howard kept things relatively simple. Wearing a Superman cape, Howard received a high pass from Jameer Nelson standing behind the net. Howard magnificently jumped from just inside the free throw line and threw down an impressive slam, much to the bewilderment of Kobe Bryant and Magic Johnson. Howard’s dunk is iconic. The only reason it doesn’t rank higher on this list is that it technically wasn’t a dunk. He threw the ball and never touched the rim. Still, it was an incredible display of sheer athleticism. Before the ABA-NBA merger, Dr. J. put the dunk contest on the map in the first ever competition in 1976. Facing off against Nuggets guard David Thompson, Erving pulled off a miraculous dunk, running from one end of the court and slamming it down from the free throw line. Erving’s slam was so influential it led to more high-degree difficulty free throw dunks. Without Erving stealing the show more than 40 years ago, the dunk contest wouldn’t be nearly as big of a deal as it currently is. He started everything. In terms of pure creativity, the high-flying Green takes the cake, or better put, the cupcake. Back in 2008, Green attempted something entirely new, blowing out a candle on a cupcake while throwing down a two-handed slam. On first glance, the dunk didn’t seem all that impressive, but on closer look, Green actually managed to blow out a candle while dunking at the same time. Getting up that high and managing to blow and dunk at the same time shocked everybody upon seeing the replay. Kenny Smith and the TNT crew were at a loss for words. Dee Brown might not be a household name, but his no-look slam dunk from the 1991 contest deserves all the praise it can get. Checking in a 6’1″, 160 pounds, Brown threw down a dunk with his arm covering his face. Not being able to see the rim was risky and somewhat dangerous. The fact Brown pulled it off at his height makes it an all-time great slam. Spud Webb participating in the dunk contest was impressive enough. But, the 5’7″ Atlanta Hawks guard wowed the crowd during the 1986 contest, defeating teammate Dominique Wilkins with a series of impossible throwdowns. Webb’s last dunk was his best, as he lobbed the ball up in the air, caught it on the bounce and threw down a reverse dunk to win the contest. Even Michael Jordan couldn’t believe what he just saw. 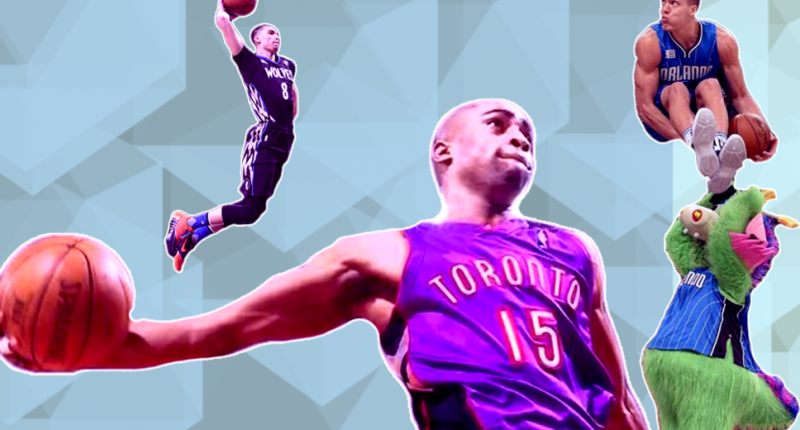 Vince Carter is the single best dunk contest participant in the event’s history. Back in 2000, Carter created one of the most-remembered slams, throwing a between-the-legs dunk off of a high bounce pass from teammate Tracy McGrady. The dunk is ‘Vinsanity’ personified. Smith’s call, the crowd’s reaction, Carter pointing to the sky and declaring “it’s over” are about as boss as it gets. Michael Jordan had a slew of memorable dunks during his time in the dunk contest, but none were more perfect than his 1987 ‘kiss the rim’ dunk. Everything about this dunk was perfect. Jordan’s form, how high he got up, the double-clutch before the slam and the dunk itself were just nailed. It’s not the fanciest dunk, but having the GOAT throw down a 50 makes it one of the greatest. Only an uber-athletic high-flier like LaVine would even attempt this dunk, let alone throw down something as good as this. Somehow, LaVine took Erving’s (and later MJ’s) dunk and added a wrinkle making it one of the hardest and high degrees of difficulty attempts ever. LaVine took off from one step inside the free throw line, put the ball between his legs and threw down a Statue of Liberty slam. He made it look incredibly easy. LaVine might have won the contest in 2016 in one of the greatest head-to-head battles ever, but Aaron Gordon’s mascot-assisted dunk still is the best single slam from the event. This dunk had everything: It was stylish, featured an assist from the team’s mascot, and blew everyone’s minds in the building. Gordon literally jumped over Orlando’s mascot, while somehow transferring the ball between his legs and throwing it down. It doesn’t make sense. You can’t even pull this move off in a video game. When I think of the best dunk contest dunk ever, there’s no question this is the best that’s ever been done. In his first dunk of the night, Carter managed to fluidly throw down a reverse 360 windmill, making it look so effortless and perfect. Carter knew he did something special immediately after throwing down. His dunk repopularized the contest. On every level it was ridiculous, and it set the tone for future contests for years to come. Nobody did it better.